Immunization records (Students will need documentation of full immunization to participate. Specific information about the requriements can be obtained during orientation). 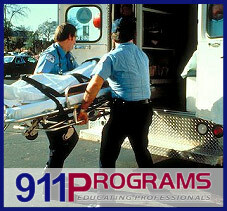 Applicants should have some field experience as an EMS provider. Tuition, uniform shirt, lab & clinical fees, ACLS, and access to the online classroom ALL INCLUDED IN TUITION. $6500 tuiton is for 2014 only to introduce our new paramedic format. The next course will be priced approximately 50% higher. We are so confident in our program graduates that as of April 2014, 911Programs is offering a 100% money-back guarantee on your tuition if you cannot pass the NREMT Exam. If you would like more details, inquire by email or phone. If you are interested in Paramedic (not currently being offered) and are either unable to attend any of the current courses or there are none scheduled at this time, add your name to the waiting list.